We recently published a review in a special “Microfluidics and Miniaturization” issue of Electrophoresis. This work was a collaboration between myself, Jason, Alex, Steven, and Brian. Brian and Steven contributed knowledge on rare cell adhesion, Alex discussed fluid mechanics at the microscale, and Jason and I reviewed device designed strategies. An obstacle array is used to induce cross-streamline motion, bringing target cells into contact with an immunocapture surface, while smaller non-target cells have relatively few collisions (represented by stars). The article reviews biorheology, rare cell surface markers and adhesion models, as well as general transport phenomena at the microscale. Several design strategies, including micromixers, porous filtration systems, and obstacle arrays, are presented in a transport context. 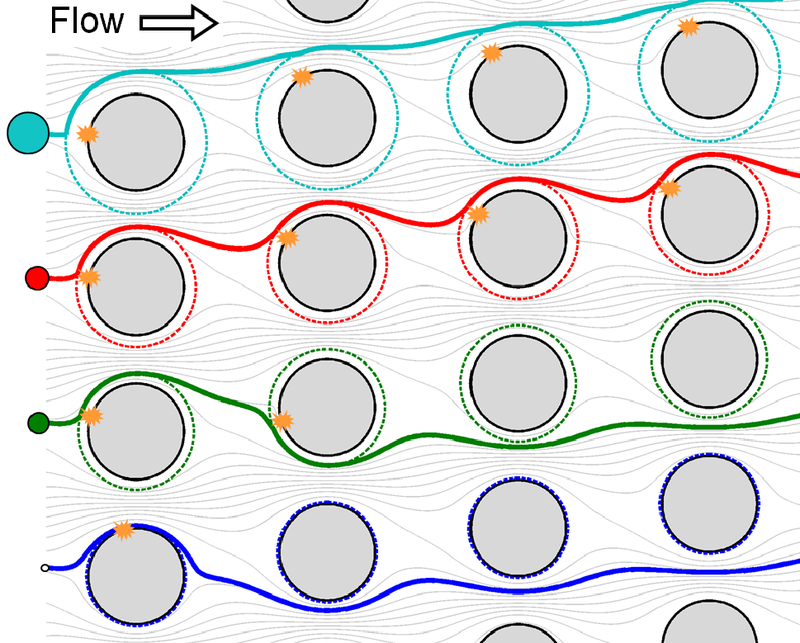 A key conclusion is that advection (i.e., motion of the fluid itself) dominates diffusion in most rare cell capture devices; a successful device is designed not by maximizing the ratio of surface area to volume, but by inducing cross-streamline motion to bring cells into contact with a capture surface. This review summarizes the knowledge we have gained developing the GEDI microdevice, and we hope that other researchers will find it useful in the development of their own rare cell capture devices. A copy of our review is available on my website. Epithelial cell surface marker: A protein or receptor sticking out of the cell membrane of epithelial cells. EMT: Epithelial-to-mesenchymal transition, where cells lose biomarkers associated with their organ of origin and become more stem cell-like. Tumor genetic heterogeneity has emerged as an effective biomarker of malignant processes1-4. However, limited access to tissue in solid tumors makes repeated sampling and tracking of tumor mutations infeasible. CTCs can serve as a “liquid biopsy”, allowing researchers to study genetic progression in real time. The paper I’m reviewing today, “Single Cell Profiling of Circulating Tumor Cells: Transcriptional Heterogeneity and Diversity from Breast Cancer Cell Lines” by Powell et al., demonstrates the utility of single-CTC genetic profiling5. The article is Open Access and available on PLoS ONE. The technology used in this study is called the MagSweeper, developed by the Jeffrey Lab at Stanford. Magnetic beads were coated with an antibody targeting epithelial cell surface markers. These antibody-coated (i.e. immunomagnetic) beads were mixed into blood samples, resulting in cancer cells covered in beads, as shown in figure D. The blood samples were diluted with saline solution, and cancer cells were extracted using a magnetic source. Captured cells were washed while attached to the magnet, and then released when the applied field was removed, as shown in figure B. Cell gene expression and viability were shown to be unaffected by this capture process. I presented my recent work on cell capture simulations at the Fall meeting of the American Physical Society’s Division of Fluid Dynamics (APS DFD) in San Diego. During this podium presentation, I detailed a reduced order model for predicting the adhesion of rare cells, such as circulating tumor cells (CTCs) to antibody-functionalized obstacle surfaces in microdevices. This work builds on my past projects involving particle collision dynamics and will facilitate the design of a new generation of rare cell capture microdevices.